I was in Redwood City for a two-day offsite meeting at the Sofitel. In addition to those who work in the Bay Area, we had people from Southern California, Virginia, Florida and Canada. 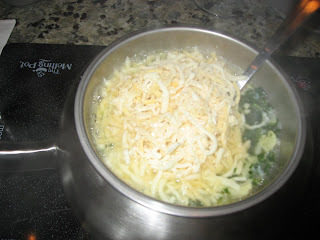 In the evening we drove down together to a newly opened fondue restaurant called The Melting Pot in San Mateo. It is part of a national chain, but I have never come across one before. Dinner turned out to a very interesting experience indeed. For one, the restaurant is located right next to the train station and the rumble of the trains speeding past makes for an unusual setting. Second, the concept of sharing fondue and cooking entrees at the table is a lot fun and different from the usual dinner experience. Dinner began with Cheese Fondue. The one in front of me was a Spinach Artichoke fondue that was prepared at the table over electric heaters built into the table itself. We dipped fresh breads, green apples, and veggies into the creamy fondue. I actually enjoyed this fondue much more than the one I had last in Grindelwald, Switzerland. The fondue was followed by a salad. I had chosen the featured Athenian salad which was romaine and ice berg lettuce with ham, pepperoni, olives, and roasted red pepper with a white balsamic vinaigrette sprinkled with feta cheese. Perhaps a little heavier than the other salad selections, but absolutely delicious. Our entree today was called Pacific Rim. A plate of teriyaki-marinated sirloin, white shrimp, marinated pork tenderloin, breast of duck, breast of chicken and potstickers accompanied by fresh veggies and a variety of sauces. 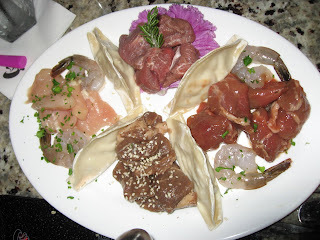 The idea is to cook the meat and veggies on the table on a cooking style of our selection. 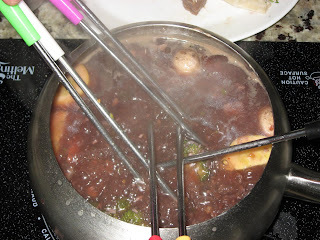 The cooking style we selected at my table was called the Coq au Vin Fondue a boiling pot of fresh herbs, mushrooms, garlic, spices in burgundy wine into which we dipped our skewers with meat and veggies to cook them. Pretty cool, right? Our host for tonight had selected the 2004 BV Napa Valley Tapestry red wine which turned out to be a great choice and went well with the cheese and meat. And the dessert turned out to be equally exciting. Plates of fresh strawberries, cheesecake, tasty marshmallows, pound cake and brownies to dip into some decadent chocolate fondues. The dessert fondue on my table was the Cookies 'n Cream made of dark chocolate topped with marshmallow cream, flambeed and swirled together with crushed Oreo cookies. Another one which featured milk chocolate with crunchy peanut butter was a big hit with the group too. I tasted some Hungarian ice-wine for the first time along with dessert. It was great! 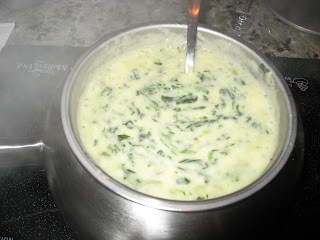 The Melting Pot offers a great alternative to the regular dining destinations when you are out with a group. Private tables, great service, an unique dining experience and a long wine-list are all things that make this place worth a visit. Swiss, Latin America, US, Spain, Italy, Cambodia... seems like you are on a foodie version of Around the world in 80 days! You are certainly living the high life. I do have comment on Melting Pot, only because I had lunch there on Monday to celebrate a coworkers brithday.. The food was OK, but the real shock came at check out.. $125 for lunch for 5. With no wine.. Yikes. Not sure the value was there. @rohit: Heh! I guess that's true. Thanks. @sank: I didn't have to pay for the dinner, so don't know how expensive it was. That does sound expensive! What a lovely Fondue dinner and how great you describe it in ever details. My mouth is watering while watching the pics. Ohh yea, the dessert sound great too and that goes for the ice-wine too. Never tasted it but will give it a try. 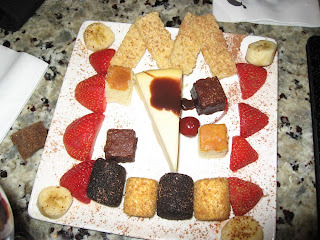 Been to the melting pot just once, for a friend's birthday last year... Sure enjoyed the experience, food was just okay though! No surprise here, as a French, I love cheese. So I love fondue (which means "melt" in French BTW). @sig: Yes. It is the experience that is interesting here, esp so when you are in a large group. @zhu: Hey, thanks for being such a regular visitor. I am back in Pune now and will get back to visiting your blog (and others).